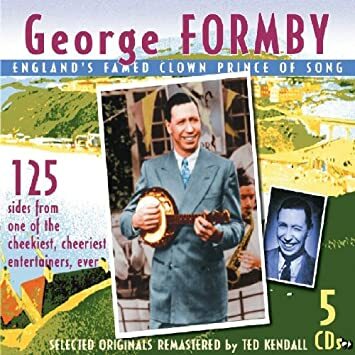 George Formby: England’s Famed Clown Prince of Song – It was actually Khoi who piqued my interest in this English music hall entertainer, a rather unlikely star of stage and screen by today’s standards. The son of a performer who died young, Formby took up the same business, initially with his dad’s songs and character but later coming into more of his own. He was known for playing the ukulele, for his gormless local Lancashire boy personality, and for the suggestive nature of his lyrics. Of course, what was risque back in the 1930s is rather quaint these days, but it’s still pretty amusing. One of his earliest hits, “Chinese Laundry Blues,” subverts the rhyme scheme to avoid certain words: “Mr. Wu, he’s got a lazy eye that flickers/You ought to see it wobble when he’s ironing ladies’ blouses.” Another one of his famous numbers is “The Window Cleaner,” all about the inappropriate things a nosy window washer can see. And other songs use rock candy and the ukulele itself as euphemisms. There’s not a lot of variety in song structure, but the songs are really fun to listen to. From what I’ve read, Formby’s wife was usually able to finagle songwriting credit for George so he could get a share of the royalties, even though he didn’t actually do any of the writing. One writer who wouldn’t play ball in this respect was Noel Gay, who was responsible for “Leaning on the Lamp-post,” a song later covered by Herman’s Hermits. It fit quite well into their repertoire as well. I looked up the writer, and he was also responsible for “Ali Baba’s Camel,” which I know from the Bonzo Dog Band’s version. Anyway, this five-disc set collects Formby’s recordings from before World War II. There’s another box with the rest of his material, which I’ve added to my Amazon wishlist, but I haven’t heard yet. While I don’t think Formby is that well-known in the States these days, he seems to still be well-regarded in the United Kingdom. In the alternate universe of Jasper Fforde’s Thursday Next series, he’s been elected President of England. In Robert Rankin’s Necrophenia, there’s a lost city where the people worship him. And George Harrison was a member of the George Formby Society. Turned out nice again, hasn’t it? This entry was posted in Albums, Authors, Humor, Jasper Fforde, Music, Robert Rankin, Uncategorized and tagged england's famed clown prince of song, george formby, herman's hermits, music hall, necrophenia, noel gay, ukulele. Bookmark the permalink.